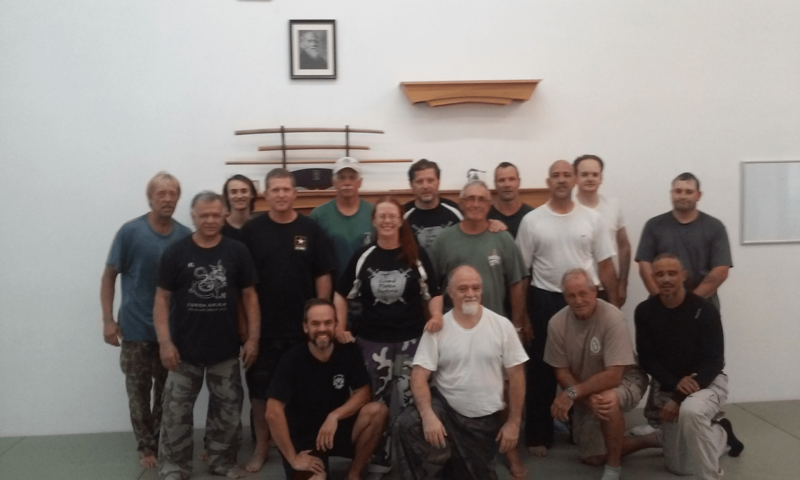 We had a one day intensive Systema seminar with Dave Merrell at Aikido of Palm Beach County and sponsored by Systema Boca. It was awesome. There was a good turnout and the bulk of the crew were Systema practitioners. This is the first time I met and trained under Dave. I have heard lots of great things about him over the last few years and they seem to be true. He’s completely into this and it shows. A few of things I took away from yesterday’s seminar are; 1. accepting what you are given, 2. body alignment and 3. breaking form. Accepting what you are given is in essence absorbing your opponent’s energy. But it is also not giving back to your opponent any information that you have his power. For instance, if you are grabbed on the wrist, let the wrist and your whole arm go sorta limp. I say that because its akin to being limp but you still have some energy and power to your wrist/arm but not enough to trigger a response in your opponent. You then move towards your opponent while keeping your non-response operative. I was amazed when Dave demonstrated this and I grabbed his wrist. It was as though he wasn’t there. And because I was receiving no feedback from him regarding my grab, it tricks your autonomous being into thinking that the grab is working. But the opposite is true. Dave’s response to my wrist grab was to move towards the grab and capture my hand. At the same time, he moves around the point of energy and in a sublime way, takes control of some other point of my body. Which flows into breaking form. Breaking form is the practice of monopolizing points on your opponents body to disable him. In Systema, the areas you want to concentrate on are head, shoulders hips, knees and ankles. Its these areas to watch because if your right shoulder moves back, then your left shoulder will be moving forward. Its how the body works and it points out an open spot. When this happens, its doesn’t take much to control that open spot because your opponents weight has shifted in order to compensate for his movement. There is another important element to breaking form which is that once you get the open spot you move it to the contrary part on your opponents body. The practical application of this and how it was taught, is if you have your opponents left shoulder in control, then you drive that down and through him to this right hip. The same would be if you had his right hip, then you drive that down into his left knee and so on. The result is that your opponent just melts into the ground. This is not a muscling technique. Done properly you should expend very little energy. This is body alignment. One thing that I liked and want to mention is the warm up. We did some stretching but Dave emphasized how important it is to work your core. We did a number of pushups, regular closed fist and twenty count, then leg raises focusing on your stomach muscles and finally squats, regular and twenty count paying attention to keeping your back straight. The whole time lecturing us on proper breathing in order to control your body. Needless to say, we were all sweating and out of breath before instruction even began. For the last hour of the seminar, we did kick response; your opponent kicks you and you respond. Which seemed to me a variation on the principles of the above. For instance, a front kick is coming at you and you move slightly out of the way without stepping and move your opponent by moving his kick with your knee to a spot he doesn’t want to be, off balance. These are the three things that stuck out. A lot more was taught and I may update this post as I recall more. But for now, this is it and it was a Saturday afternoon well spent. As Dave explained, you need to watch the body. It will tell you everything you need to know.